The smell of linseed oil mixes with that of the Heins’ pet rabbit, which scurries through the home during our interview. In the front room a few works are hanging. 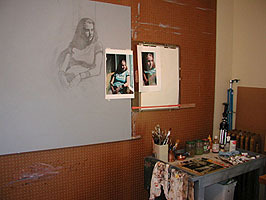 A handful of small works are also in the studio, and a painting, just begun, hangs on the wall. Otherwise, the place seems sparse, even for a well-ordered artist like Hein. Most of Jeff’s works are currently hanging in the Magpie Gallery, a few blocks from his home. Prior to the interview, we stopped by to see the show, which features a number of large portraits. While there, Annette Dunford, co-owner of Magpie Gallery, tells us that one landscape in the show was sold while it was still being hung. We are discussing Jeff’s work when a customer asks after one of the portraits. She’s flustered for a moment and has to explain that she’s not sure what the price is. Jeff had not bothered to establish prices for portraits. After all, who would want to buy a painting of someone they did not know? When, a few minutes later, we stop in at Jeff’s home, he is pleased with the news. Not only for the opportunity for a sale, but because, as we learn in our interview, one of his primary goals right now is to paint pictures of people that go beyond portraiture and have a broader appeal. 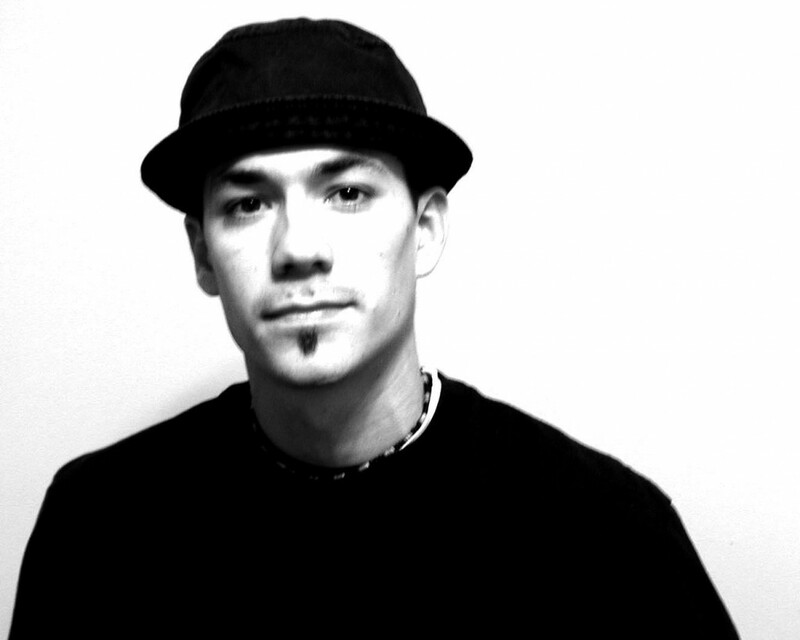 Jeff Hein is an energetic individual, an evident excitement for what he does animates his body and his conversation. In his last year of studies at the University of Utah, he is a bit older than the average college senior. Hein, a New York native, first headed west in 1992 to attend Ricks College in Idaho. He returned to New York for a year to work before returning to the West — this time to Salt Lake City, where he served as a missionary for the LDS Church. That was in 1998. Hein is currently finishing his senior year at the University of Utah, but, as we learned, he rarely sees the inside of a classroom. AOU: Now, you mentioned that you’re doing independent study right now. HEIN: Yeah, I’m in my senior year right now. My teachers know that I work hard, and I just feel like it slows me down to go to school because they’re teaching me stuff that I’ve learned already. They recognize that too. AOU: So they’re giving you freedom? HEIN: Oh yeah; it’s great. They say, “Oh we’ll come check your stuff out at the end of the year.” I’ve never gotten more work done, and they know it, so that’s pretty much why it’s working out. AOU: So what, overall, was your educational experience like at the University? HEIN: I learned a lot there, but I have to say that my biggest advantage was going to Ricks, my first year at Ricks. Maybe that’s because I never took any art classes in High School. So Rick’s was my first year really studying and it was this huge jump. Maybe that’s why. But I feel like the U has been tugging me back and forth. HEIN: I want to paint a certain way, and my tendency is to paint a certain way. Even though it’s good to experiment with different things, they’ve come and gone, and I don’t know how much they have helped me. Maybe a little. The thing is, it’s always been the same direction for me. I had the same direction when I started as when I finished. So, it had to be done, it’s been an educational experience, but I’m done with it now. AOU: So what would you say your direction is? HEIN: I guess what I’m talking about basically is that the U is really loose, abstract; they’re . . . especially now – the staff has changed — they’re really concerned about your art making some kind of political statement. I’m interested in concept in my paintings but not to the point where I’m making some kind of statement about the world. It’s really not my interest. I just want to paint people. If you’re an artist and also have the talent to really get involved in those issues and really get passionate about it that’s great, but I don’t see how it’s possible to be a really good artist, devote all your time to art, and devote an equal amount of time to understanding the world and making an educated statement about it. I don’t see how it’s possible. Maybe someone could do it, but for me, as an artist, I think my job is to make beautiful paintings. But that wasn’t my experience at the U. I’ve even had people tell me I’m not an artist because I just paint things. The funny thing is they’ll use the word concept, and there are concepts in all my paintings, maybe more maybe less, but there’s concept. AOU: Maybe you’ve got 70% art and 30% concept while they’ve got 70% concept and 30% art? HEIN: Yeah, maybe. My concepts are about the art. It’s about creating emotion with light and color and trying to create certain moods. That’s concept in my mind. Although still not finished with his degree, Hein has already produced portrait work that shows an adroit control of his medium, a sensitive eye for color, and an energetic sympathy for his subjects. Mary Pickett Pierson of the Magpie Gallery purchased a portrait of her daughter from the artist, and, along with Dunford, has expressed her continued confidence in this artist’s work by giving him the show now hanging in the gallery. Along with portraits, both large and small, the show also exhibits a number of small landscapes. AOU: What about the landscapes. Is that a recent thing for you? HEIN: Yeah, I just started doing that about six months ago. It’s a way to go out and hang out with my buddy who I paint with and just to loosen up. Because portraiture, it’s like brain surgery. Even though it’s fun, it’s excruciating sometimes. But no one cares if a tree is accurate to a sixteenth of an inch. So going outdoors and painting is a nice way to say, “Man I’m gonna just start throwing paint on the thing.” It’s not that I don’t enjoy painting people. I’d much rather do that, but sometimes I need a break. AOU: Has working that way, working outside, affected the way you paint? HEIN: Yeah. The thing is, when I paint outside I always have my figure painting in mind, I’m always thinking of new ways to apply paint. For instance, the way I paint a group of trees in the background, I’ll use that brushstroke and put it into a figure. I’m always trying to experiment with brushstroke because I think that’s critical, whether painting a landscape or a portrait. AOU: What has been your experience so far with doing the portraits? HEIN: It’s funny, with portraiture, it can look dead on like the person, but if it’s not the way the client sees the person — that smile they always do or the twinkle in the eye that they always have — then to them it’s not the person. So that’s a major struggle. I’ve been thinking about different ways to tackle that problem. I’m probably going to start trying to go out to dinner with the people I’m painting or something. Just spend a day with them. Get to know them. Because with people I know it’s different. My wife is no problem. It doesn’t have anything to do with the features. It has to do with I know who she is. I’ll continue to do portraiture because it’s secure, but my passion is just painting people the way I see them, the way I want to. AOU What do you hope for your art, where do you see it going? HEIN: I’m kind of going in two different directions right now. What I want to do is start painting people and painting their features, and capturing character in their face, but leaving it ambiguous enough that it’s interesting to other people. For example, the painting of my wife — she got up in the morning and got dressed to go jogging, and to me it was immediately an interesting painting more than it was a portrait of my wife. I was like, okay, what is this about? It’s about a woman who is not dressed up, she’s not going out to dinner or a movie; she’s going about her everyday activity and I thought that would be an interesting painting — take a shot of a woman about to go onn a run. I’d like to do more of that; say, a person playing a guitar on a street corner. It’s a portrait of that person but it’s more about what they’re doing than who they are. AOU: So do you see it being about the general or the specific? HEIN: Well, it’s about that guitar player. I want to capture their personality and their face. A lot of painters will paint a figure and they will leave the face completely unresolved to kind of separate it from the viewer. But what I want to do is to paint a person where I can paint their face and really concentrate on their face; have it be a portrait of that person. But then I want it to be about them and what they do rather than “This is my cousin Joe” . . . I don’t have all the answers. I don’t know how I’m going to do it yet. I guess I want to make something that’s interesting to everybody and still is a specific face. AOU: And the other direction? HEIN: I’m starting to do some narrative stuff. The first two things I’m doing are New Testament things, which in Utah should have a good audience. AOU: But do you fear getting labeled an LDS artist? HEIN: I don’t think so; it’s not going to be my thing. And I’m going to do them different. I want to paint them like I paint my portraits and put a contemporary feel to them, not concentrate on the details of the costumes. I’m more interested in the expression of the characters. I’ll be more concerned with colors and fabrics that help my painting composition than making sure they’re authentic . . . I want it to be an extension of what I’m doing with my portraits. Hein’s excitement for the future is obvious. Despite his cordial welcome and eagerness to chat, one can not help feeling that we are intruding, taking up precious time which he could be using to develop his ideas. He is a child given a hundred dollar bill and set free in a toy store. He has the skills and the concepts and now needs only the time to give them flesh. AOU: So, when you finish school, do you have plans to go back to New York? HEIN: I used to swear to it. But, you know, things happen. I get taken in different directions all the time. I never expected to buy anything in Utah, but then we bought this condo. AOU: You put down roots? HEIN: Exactly. Things are going good here so . . . we’ll see. I want to go back home, but I’ll stick around here for awhile. HEIN: That’s a dang good question . . . I’m just gonna keep painting and hope it happens. AT THE MAGPIE’S NEST, I STREET AND 1ST AVENUE, SLC. This article appeared in the November 2001 edition of 15 Bytes.